opened with a State of The (Industrial) Nation address from Brian Holliday, one of the fathers of The UK’s PROFIBUS Group, addressing factors such as government, manufacturing, industrial infra-structure and skills, and why investment and standards such as PROFIBUS & PROFINET remain key to growth and prosperity. Karsten Schneider, PI Chairman then presented the keynote speech, bringing important news of updates on the technology including PROFINET for PA, Performance achievements and the latest development on such key areas as PROFIenergy. James Powell, author of “Catching the Process Fieldbus” and a regular presenter at previous conferences presented a case study of a customer who had switched from Ex HART to IS PROFIBUS PA utilizing a multi-vendor solution, showing that PROFIBUS PA is not just for large sites and revealing the economics of using PA and IS instead of Ex construction. Other practical presentations and case studies were delivered by David Bray of United Utilities on the subject of lightning protection while Mark O’Halloran from BAE Systems submarine division addressed key issues of safety and security in systems design and implementation. There were a number of Master Classes and Workshops, covering matters such as PROFINET system design, intrinsically safe systems, the use of profiles and the new Certified PROFIBUS System Designer course. 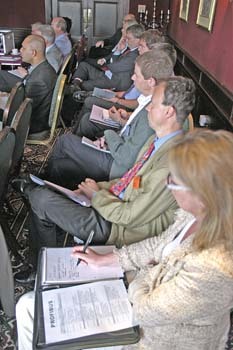 The Workshops followed a new format of multi-vendor collaboration led by a number of experts. A variety of products were connected and configured into demonstration PROFIBUS and PROFINET systems in front of the audience, much like the “plugfest” concept seen in Germany. These live, hands-on workshops covered tools and techniques for health checking and trouble shooting, PROFIBUS device configuration and device commissioning using FDT/DTM and EDDL based tools and how to migrate from legacy systems. (B) = Basic, (A) = Advanced; (PB) = PROFIBUS, (PN) = PROFINET Date: 17 June 2013, subject to change. click here to sign up for our newsletter to be kept up to date about other PROFIBUS and PROFINET news in the UK.